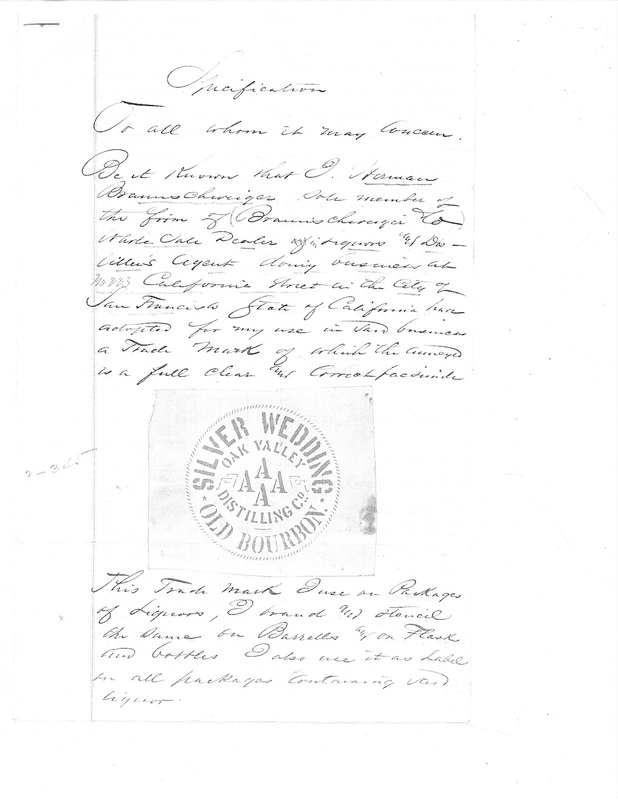 The Braunschweigers had three children, possibly four, since I found a passing reference to a married adult female by the name of Mrs. R. W. Bachrach in Herman's obituary. Edward, was the eldest, born in either 1868 or 1870, depending on which account you read, and Frida, the youngest were the two "good children". Edward became secretary / treasurer of Braunschweiger & Co., and ultimately was the one whom Herman handed the company reigns over to just prior to his death in 1905; ("& Co." - mystery solved). Daughter Frida accompanied Herman Sr. and Mother Eliise on trips abroad to Europe, and Herman Sr. to Hawaii on business. She and Edward steered clear of both trouble and the limelight. Little is known about Frida's adult life after the turn of the century. Edward appears only briefly in newspaper articles dated December 2 and 3rd 1913. The San Francisco Call reported that blonde, 45 year old, five foot eleven inch tall Edward, "retired capitalist and former Wholesale Liquor Merchant", had suffered a debilitating stroke and had wandered away from his home in Palo Alto; whereabouts and safety unknown. He was located two days later, filthy, mumbling incoherently, minus cash and jewelry, but otherwise unharmed. The third and middle sibling, Herman Jr., was a source of embarrassment from an early age. As is true with so many family's, even today, the Braunschweigers had a black sheep. Son, Herman Jr., was born in 1873. He was on a first name basis with the S.F.P.D. and his name occurs with regularity in the police blotters starting when he was 17 years old, in 1890. 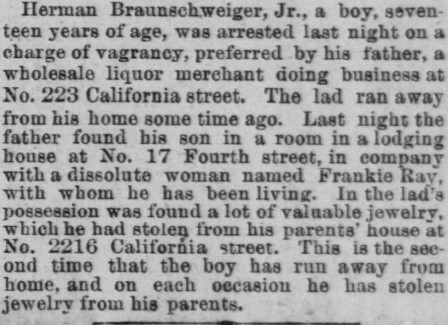 Described as a wayward son, he was arrested as a runaway and a thief. Worse yet, he had twice stolen family property prior to lighting out. Father apparently tried, unsuccessfully, to provide Jr. with stable employment and he is listed alternately as a junior accountant in 1892 and as a traveling salesman from 1893 - 1895 with Braunschweiger & Co.. 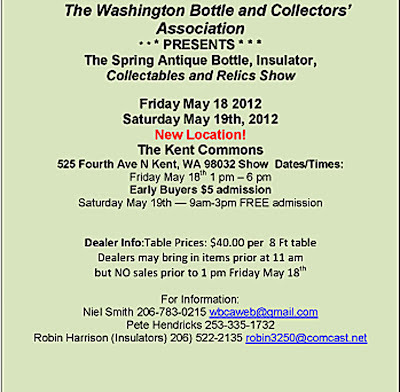 I'm guessing that he became one of his own best customers as on May 1of that year, he was committed to the "Home for Inebriates". Released some time thereafter, he relapsed. Referred to as a thug, and a mean drunk, and unable to hold down a job; he was constantly in trouble. Junior continued his downward spiral and married a "notorious lady" by the name of Sadie Nichols on August 8th 1896. Mother Elise (sic), was distraught over the marriage and died "broken hearted" on July 27, 1899. Meanwhile, by August 18th, 1896 Junior was back in front of a judge yet again, this time charged with lunacy (God how I LOVE those politically incorrect days!). His free fall continued and he in fact, ransacked the family home, located at 2216 California Street, just a few days before Herman Sr. died on October 1, 1905. The Honolulu Daily Bulletin of July 4, 1893 noted that Herman and daughter arrived that day in Honolulu on the steamer W. G. Hall, from Maui and Hawaii. 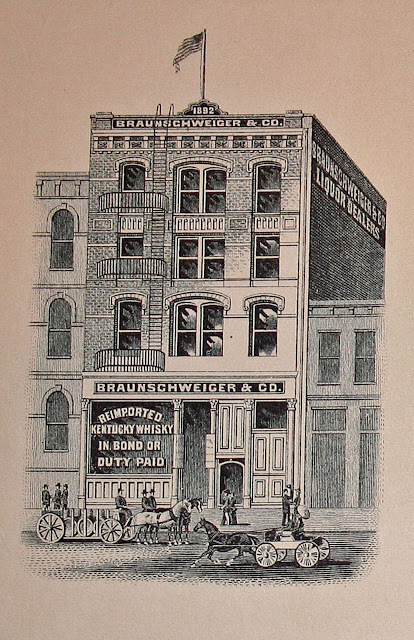 They contracted to advertise Braunschweigers products in the local newspaper and a constant presence in the classified ads was soon noted for Braunschweiger & Co's offerings. The ad campaign ran almost daily in the Honolulu Evening Bulletin, ending on Nov. 4, 1896. 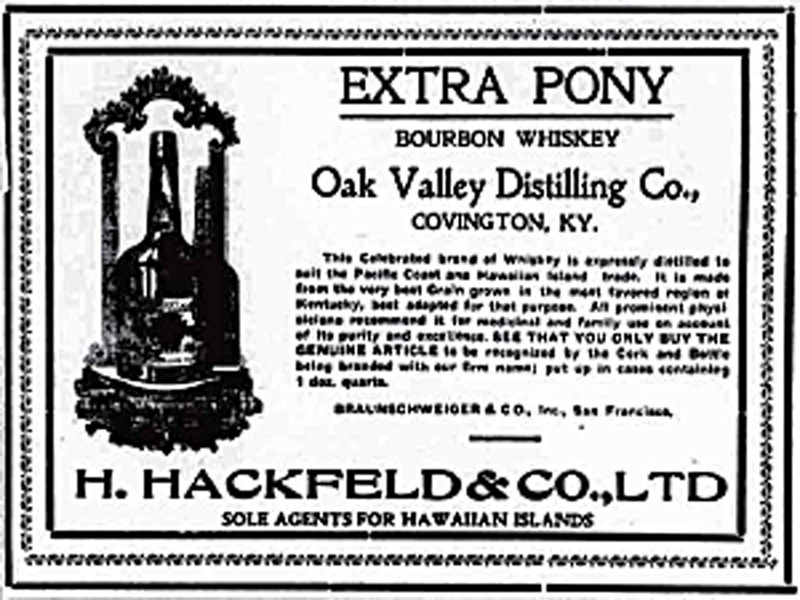 This advertising campaign, no doubt, accounts for the examples of Braunschweiger & Co. "Old Pioneer" and Bear Grass picture whiskies that have been recovered on Oahu, Maui and the Big Island of Hawaii. 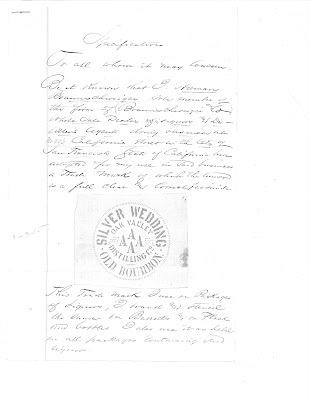 For reasons unknown, son Edward was back in Honolulu in February of 1899; most probably to check up on family business. Later, starting on October 1, 1904, Braunschweiger entered into a partnership with Hackfeld & Co. a huge commission merchant in Honolulu, to start yet another strong advertising push. The last record of Braunschweiger / Hackfeld advertising occurs in the April 2, 1906 edition of the Honolulu Evening Star; a scant few days before the Great S.F. Earthquake and Fire. 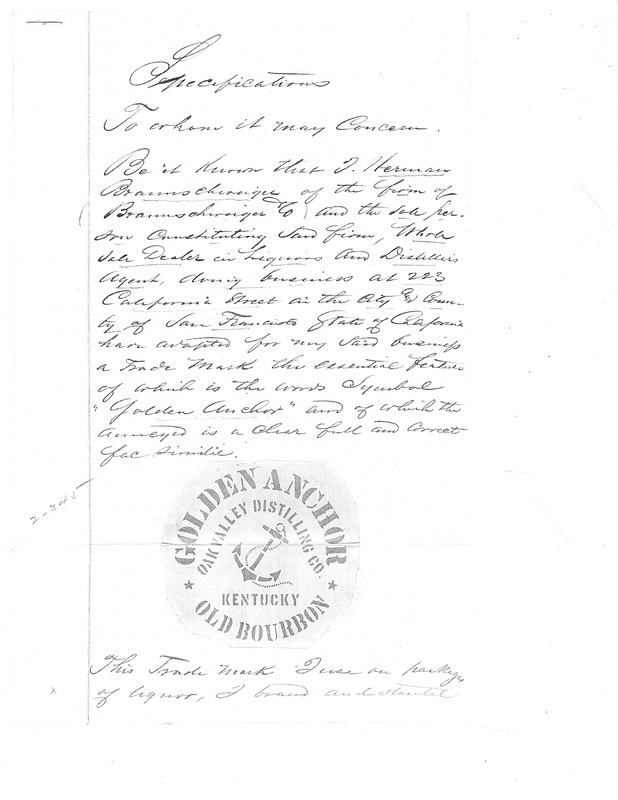 Something that caught my attention, was the repeated reference to the Oak Valley Distilling Co. As mentioned previously, Mike located claims of trademark, registering seven brands of whiskey with the State of California dated September 12, 1884. They were Golden Rule Old XXXX Bourbon, Golden Cupid Old Bourbon, Golden Chief Old Bourbon, Golden Anchor Old Bourbon, Silver Wedding Old Bourbon, Extra Pony, and Our Choice Bear Valley Old Bourbon. 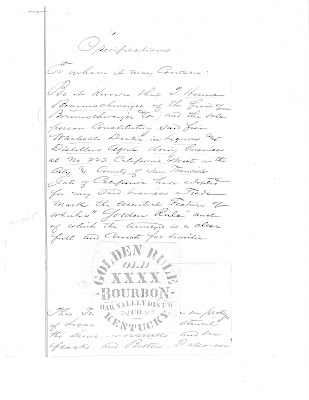 Four bear reference to the Oak Valley Distilling Co. on the labels and others actually state "Kentucky". 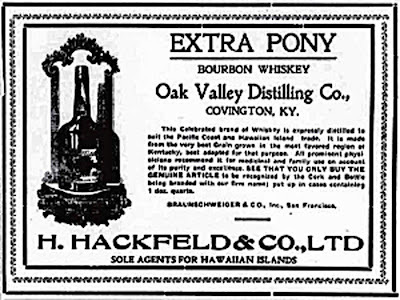 One brand registration, Extra Pony Kentucky Club Bourbon does not list Oak Valley on the label although Kentucky is spelled sans the "E" thus implying that the product was from Kentucky. 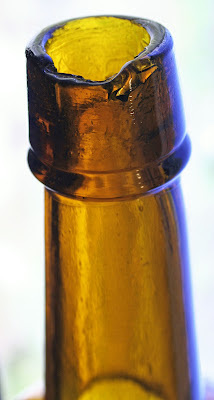 And the embossed bottles have Oak Valley Distilling Co. embossed on the first line. 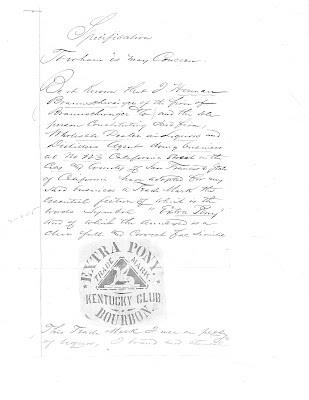 Oddly though, no where in the applications does it pinpoint the physical location of the Distillery, simply Kentucky. 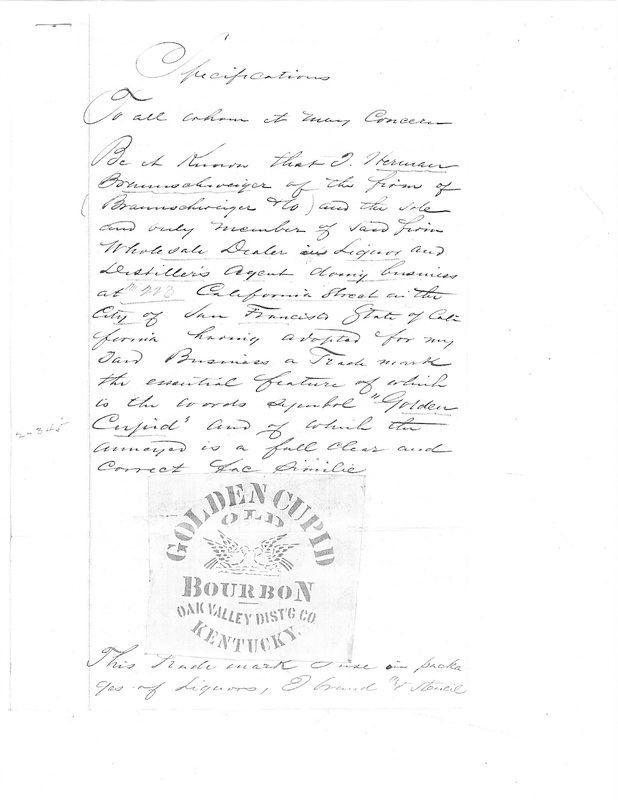 Later, around 1900, Braunschweiger cleared things up; a bit... Ads began to state that the Oak Valley Distilling Co. was located in Covington Ky. Covington was, at one time, home to numerous distilleries; all documented extensively. 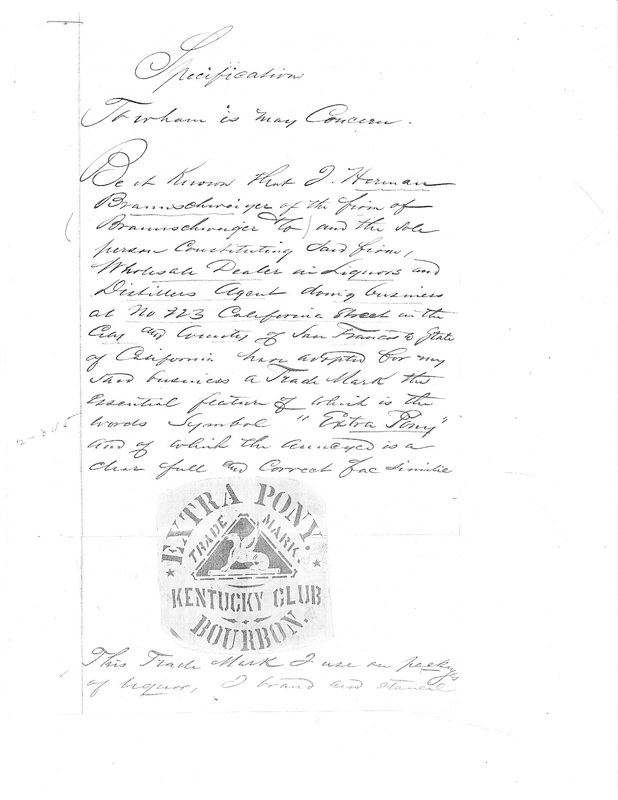 It was common practice to "puff" ones brand of whiskey by creating an association with "Old Kentucky". Period newspaper articles are rife with horror stories about drinkers being made sick or worse by consuming cheap west coast distilled spirits. 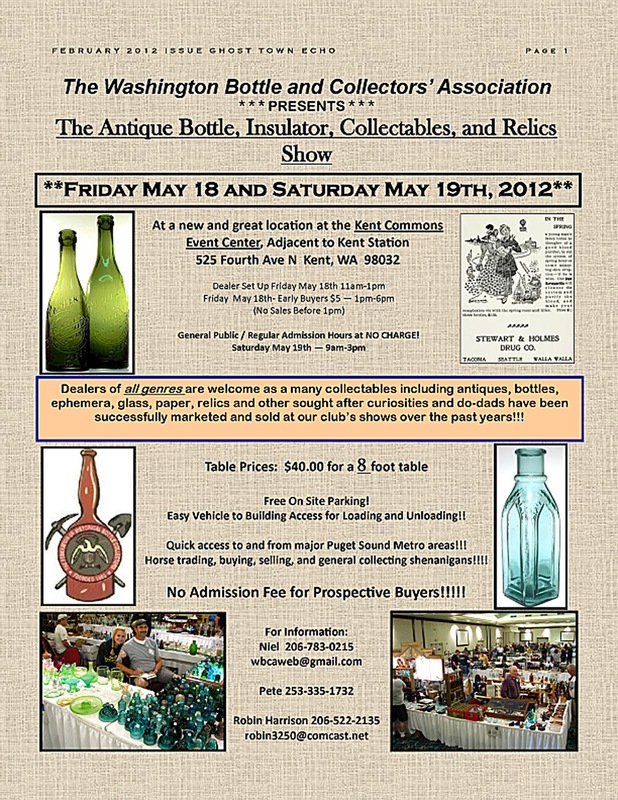 In order to create an aura of integrity, many western distillers, sole agents and sole proprietors created an illusion of legitimacy by hyping their wares as having been distilled "back east". 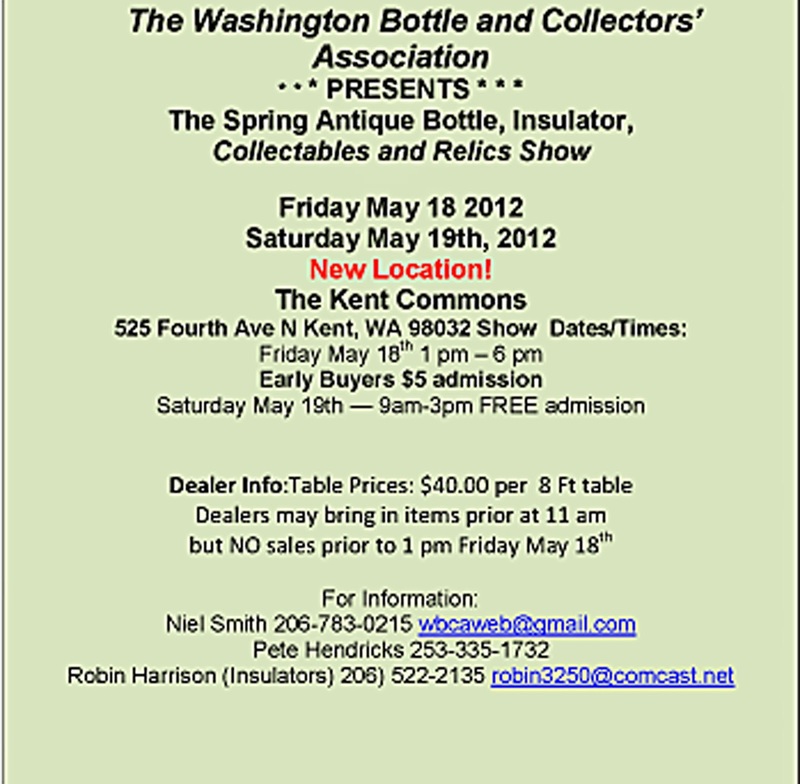 Government controls were lax when it came to pre food and drug act liquor proprietorships and agencies. It comes as no surprise that a product distilled, blended and rectified on the west coast might be touted as being something that it was not. I began to wonder if such was the case with Oak Valley Distilling Company. Verifying the existence of the Oak Valley Distilling Co. should have been a walk in the park. 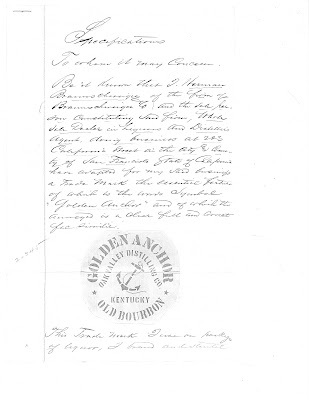 Unlike liquor dealers, detailed distillery liquor records were required to be kept by the US Government and in order to simplify things, states were broken up into Liquor Districts. Covington Ky. is located in Kenton County, which was in the 6th district. Braunschweiger did indeed register the Oak Valley brand with the govt. patent office on March 10, 1905 and had alluded to the fact that they had supplied goods to him since the mid 80's. 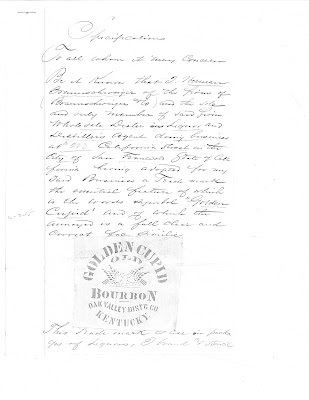 And, Snyder made reference (without documentation) to Oak Valley in his whiskey brand database, but US Govt. distillery records come up blank for any entity by that name in the State of Kentucky. Same goes for both Covington and Kenton County records, (where Covington is / was located). I was able to create tax district associations in Kentucky using single word "Oak" or "Valley", but came up empty when both words were combined into "Oak Valley". I further expanded the search to include any of the major whiskey centers on the east coast and California. Again, no hits. After weeks of exhausting every possibility, it can now be said with near certainty, that there was no such thing as the Oak Valley Distilling Company; except on paper. Now that's merchandising! Or... does this mystery somehow tie in with the term painted in large block letters on the front of the Braunschweiger Building: "Reimported"?